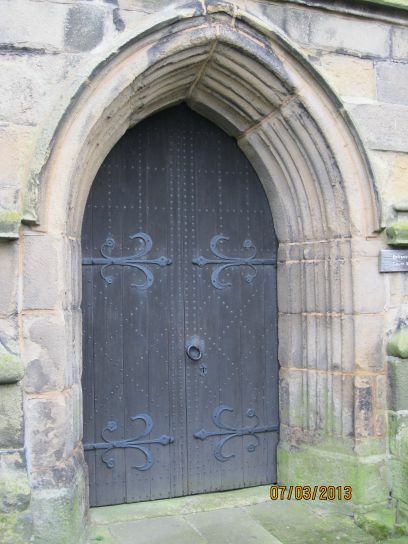 All Saints Church, Youlgreave, Derbyshire has served the local community for over 800 years and Youlgreave was mentioned in the Domesday Book of 1086. 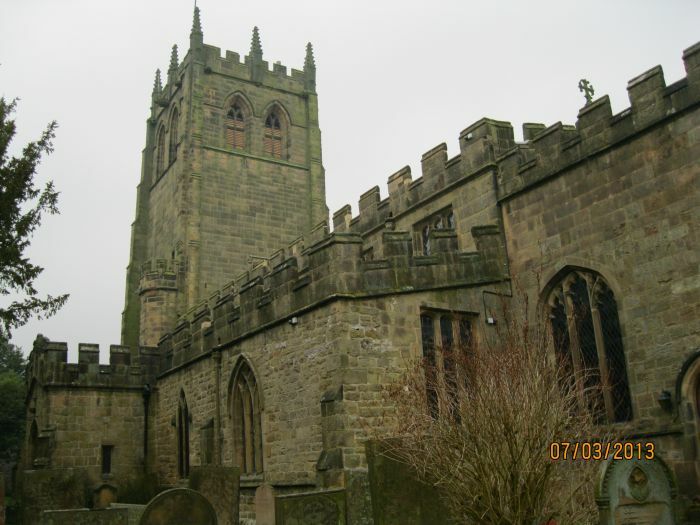 This parish church is one of the oldest, largest and impressive medieval churches in Derbyshire. 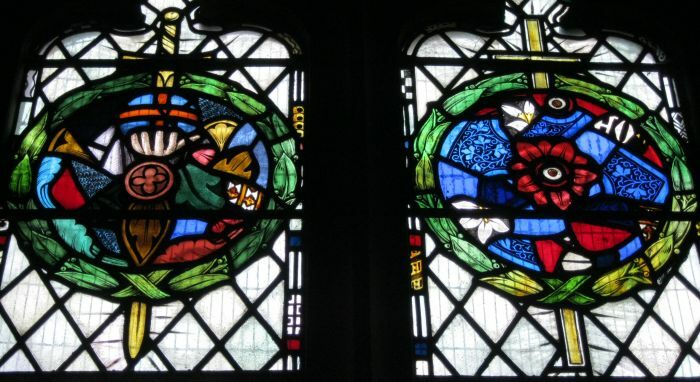 All Saints contains some fine Norman architecture, funerary monuments and earl sculptures. 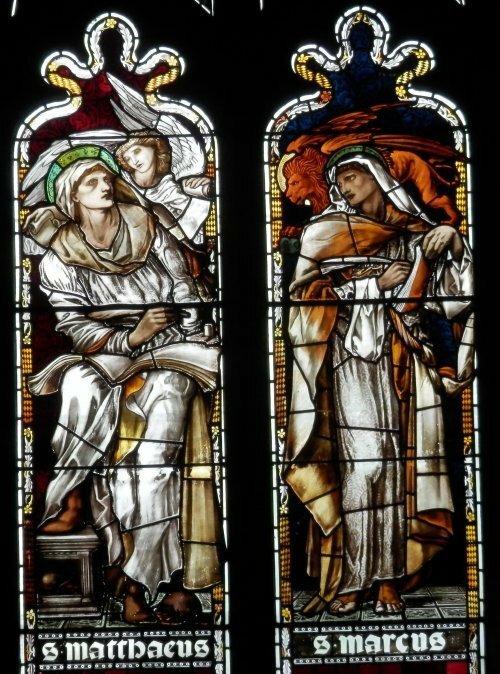 The church was sympathetically restored by the London architect Richard Norman Shaw between 1869 and 1871. 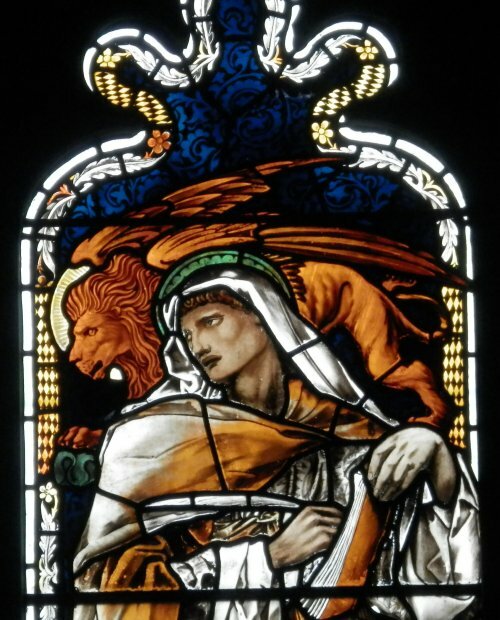 Youlgreave is also quoted on the internet and in some books as Youlgrave. e.g. by buying the excellent guidebook for £2 (2013) and I hope the images below persuade to take the trouble to visit. 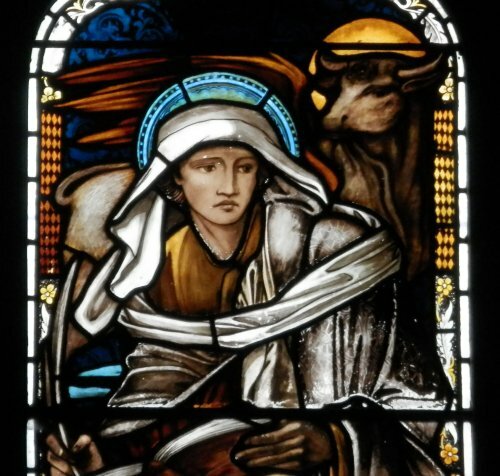 My great thanks to Brian Roche (BR) for additional photographs in 2017, particularly of the wonderful East Window of All Saints Church, Youlgreave. 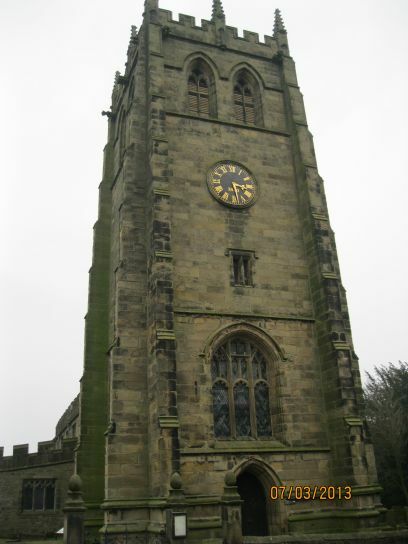 All Saints Church, Youlgreave, Derbyshire: The large bell tower stands at the west end of the church nave and is Perpendicular in style. In the lower centre of the right-hand picture is a projecting stair turret probably built in the 17th century. It has four angled buttresses to support this ~100 ft high tower. 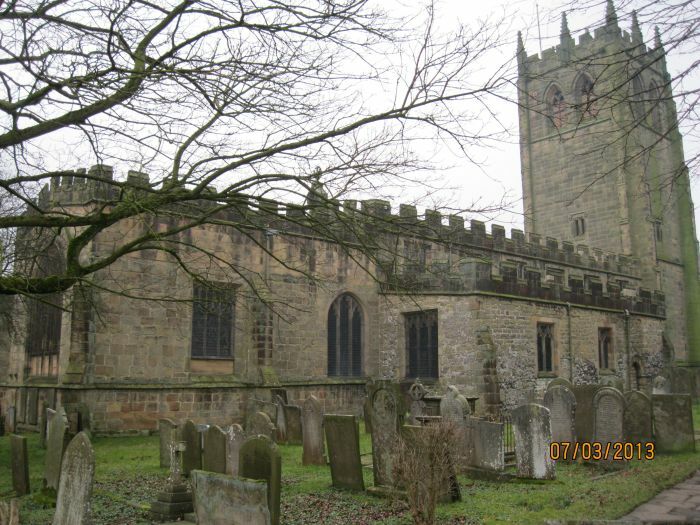 All Saints Church, Youlgreave, Derbyshire: Pevsner describes this as "One of the most impressive churches in Derbyshire" in his famous series of books on architecture - "The Buildings of England - Derbyshire". The top of the walls have battlements. 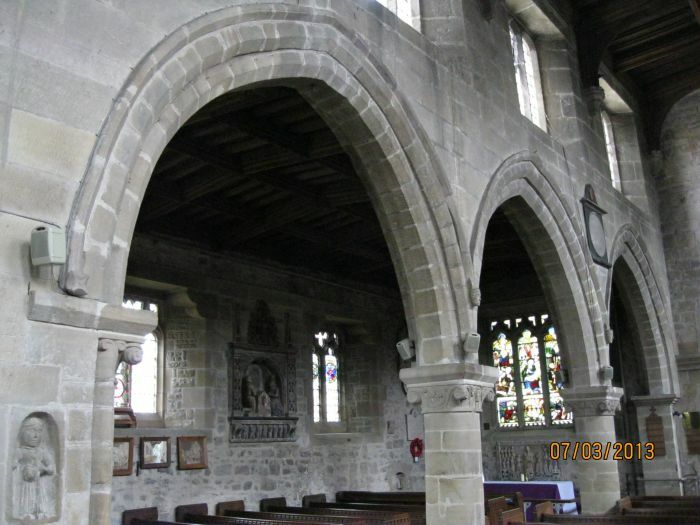 All Saints Church, Youlgreave, Derbyshire: On the left, below the west tower is 15th century medieval south doorway and porch, in the centre is the outer wall of the south aisle and to its right, the nave. 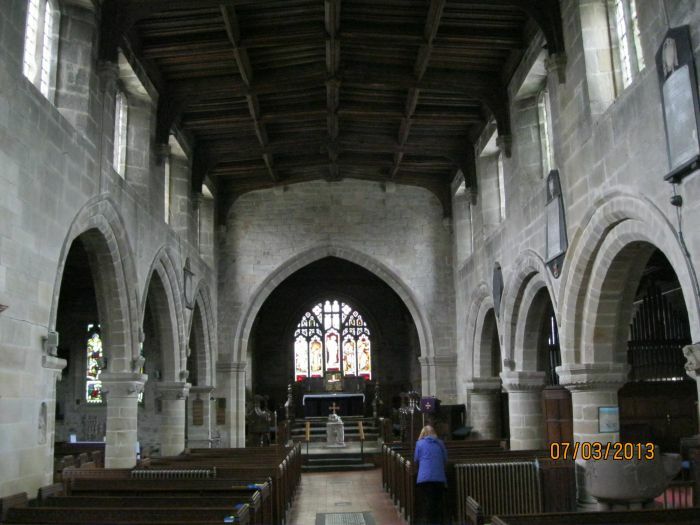 All Saints Church, Youlgreave, Derbyshire: Looking down the relatively wide 12th century nave of the Norman church. 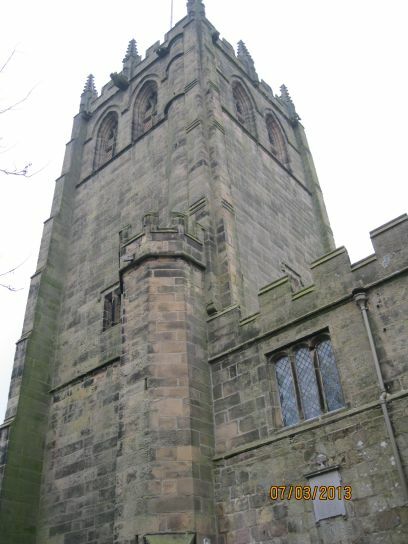 The tower (from under which this image was shot) and the west end of the present nave date from the 15th century. 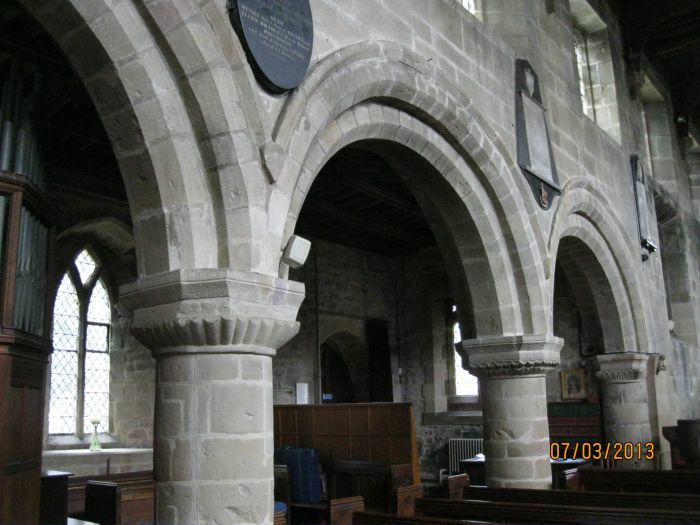 The nave has two three bay arcades, with sturdy circular piers with carved capitals from the later 12th century. 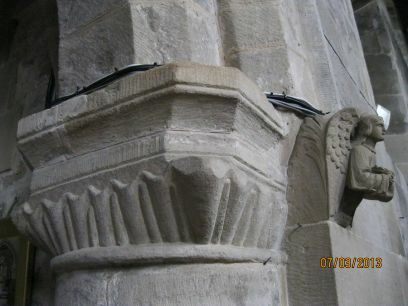 All Saints Church, Youlgreave, Derbyshire: The unique and curiously carved font near the south door entrance at the west end of the original Norman nave. 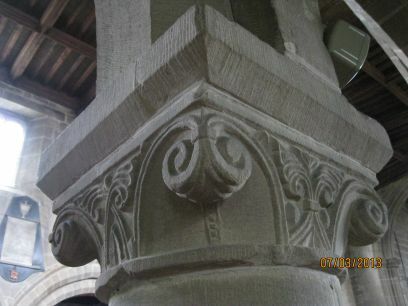 It is made of red sandstone and consists of a simple vertical bowl standing on four shafts (little piers!) 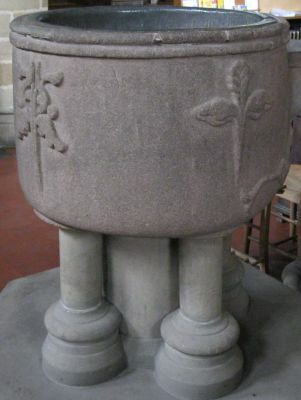 with a smaller stoup carved out of the same block of sandstone as the bowl. 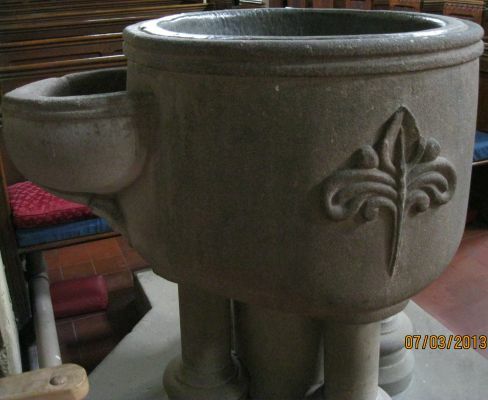 The font originally comes from the daughter church at Elton. 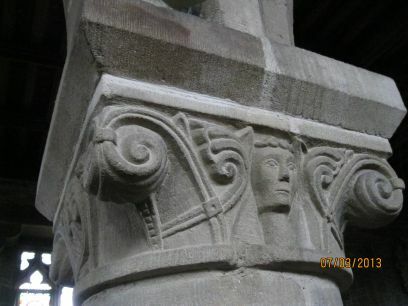 All Saints Church, Youlgreave, Derbyshire: Two carvings set into the walls of the nave. 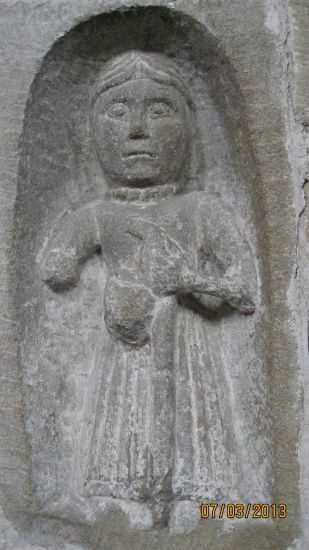 Left: This looks quite an early carving of a figure - is it Saxon? 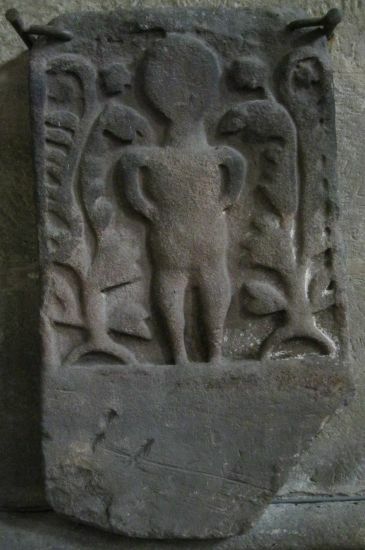 Right: At the junction of the nave and its later westward extension is a small carved figure with a ruff, frilled collar, carrying a staff and pouch. Dating from the later 12th century it probably represents a pilgrim. 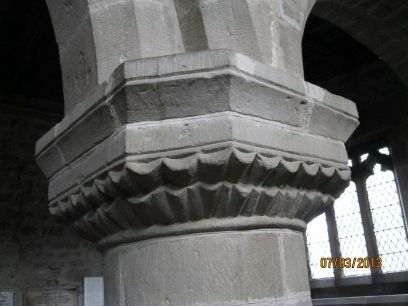 All Saints Church, Youlgreave, Derbyshire: The oldest parts of the church are found in the nave eg the double chamfered earliest curved arches of the south aisle and the carved capitals of their stout circular pillars (piers) - see pictures below. This is late Norman architecture dating from ~1150 to ~1170 and was built on the site of an earlier Saxon church or smaller Norman church? The outer walls of the south aisle date from the 14th century. 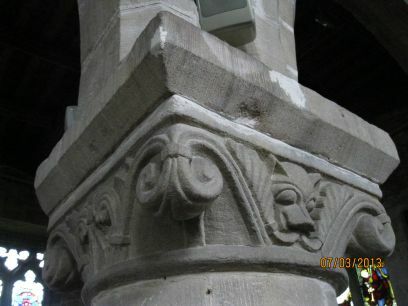 All Saints Church, Youlgreave, Derbyshire: The later 12th century (~1180-1200) double chamfered pointed arches (more Gothic style) of the north aisle and the capitals at the top of the 'thinner' round pillars-piers are much more finely carved with floral and human and animal heads (see pictures above). This phase of architectural development is described as 'Transitional' (Norman ==> Gothic style) and involved a major enlargement of the church towards the end of the 12th century. The outer walls of the north aisle date from the 12th century and the stonework is quite rough! 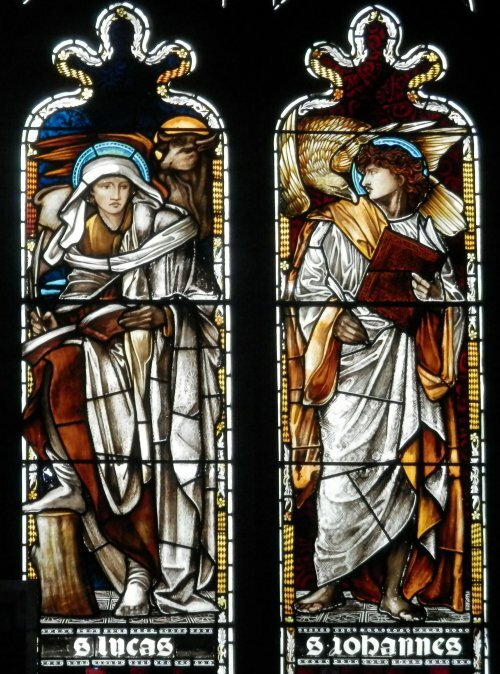 The present windows were inserted in the Victorian restoration in the late 19th century. 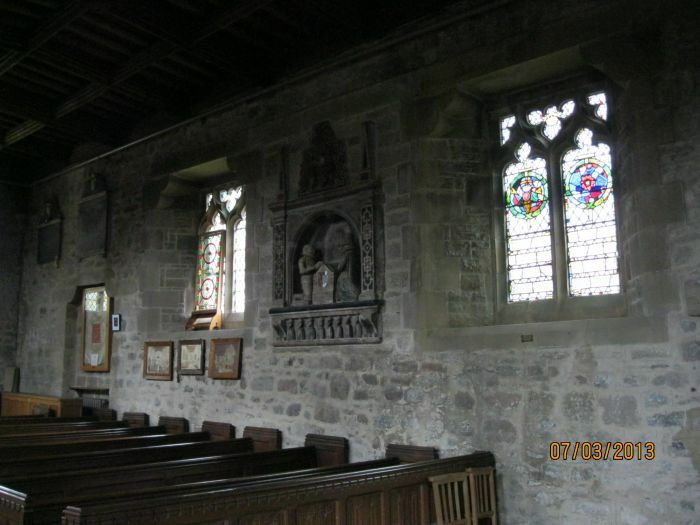 All Saints Church, Youlgreave, Derbyshire: Some of the stained glass windows and funerary monuments in the wall of the north aisle. 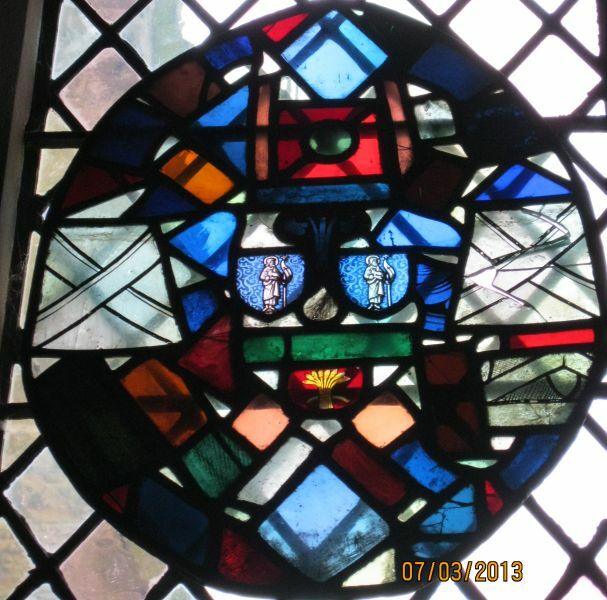 All Saints Church, Youlgreave, Derbyshire: This looks like a collection of fragments of medieval glass in a stained glass window in the west wall of the north aisle. All Saints Church, Youlgreave, Derbyshire: Details of the north aisle Jacobean wall memorial to Sir Roger Rooe of Alport who died in 1613. 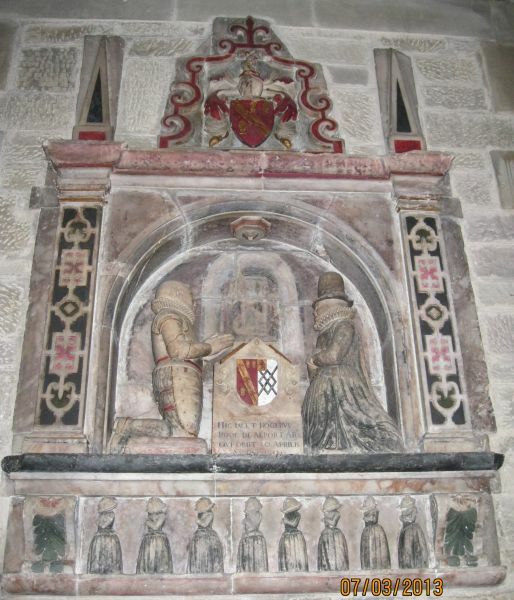 It shows the knight and his wife (wearing tall hat) kneeling in prayer facing each other across a prayer desk and below them, small effigies of their eight children. 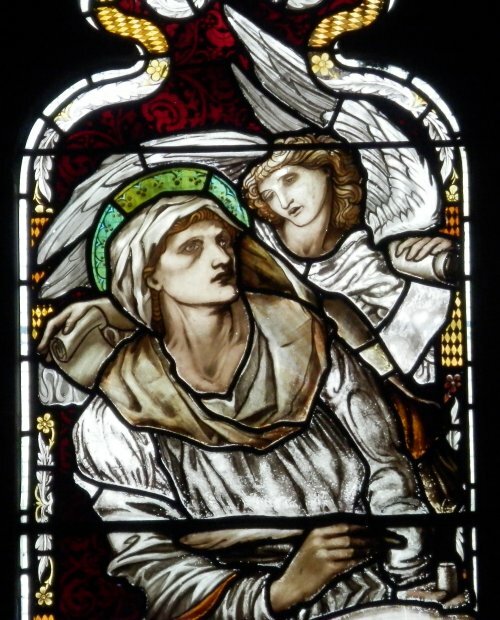 All Saints Church, Youlgreave, Derbyshire: In the north aisle wall is a stained glass window to the memory of Rennie Crompton Waterhouse of Lomberdale Hall, Middleton-by-Youlgreave, who was killed at Gallipoli in 1915. 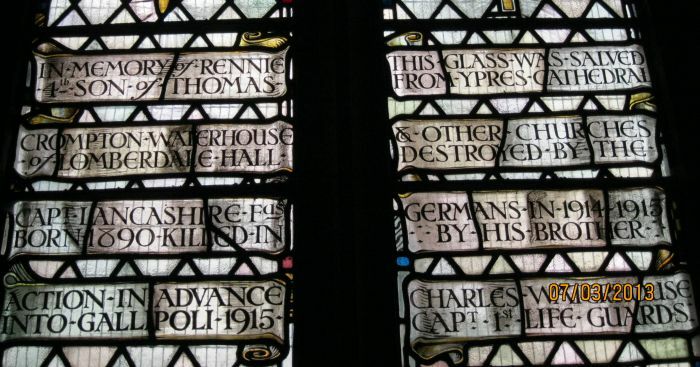 As an extra note of poignancy, the it includes glass collected by his brother from the destroyed cathedral at Ypres and other Flanders churches. 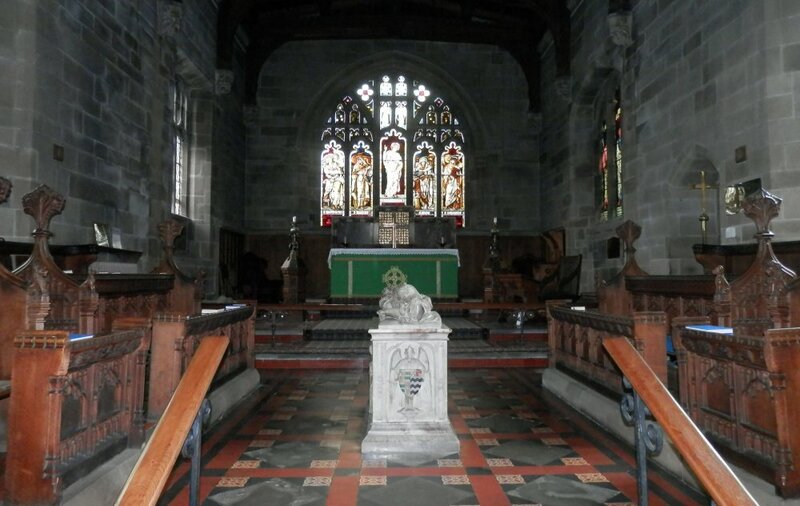 All Saints Church, Youlgreave, Derbyshire: Youlgreave church has some fine examples of medieval alabaster quarried from Nottinghamshire and Derbyshire. 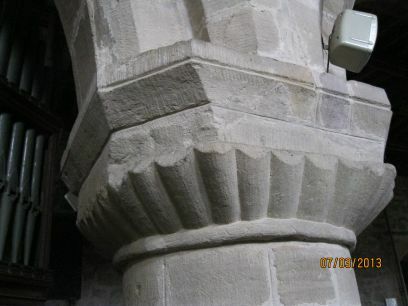 The stone was highly valued in the middle ages because it is soft and easily carved when first quarried but then hardens and readily polished to produce a fine finished surface. 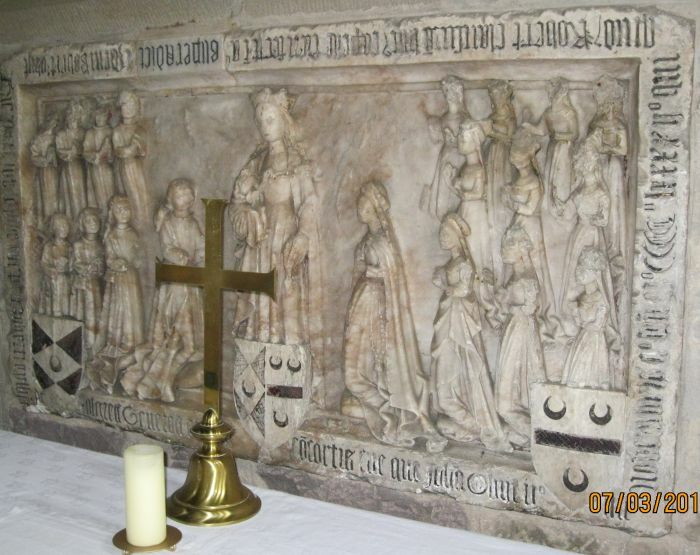 Above is illustrated the late 15th century (1492) alabaster Reredos in the altar of the east wall of the north aisle depicting a Virgin and Child flanked by a man and a woman, he with seven sons and she with ten daughters, seventeen children in total! 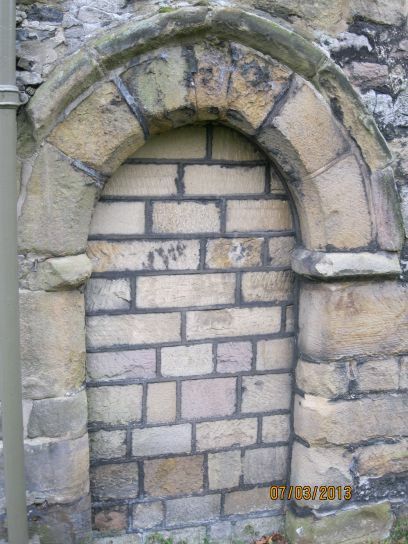 The inscription reads "Here lies under this stone the body of Robert Gilbert (Robert Gylbert) of Youlgreave and Joan his wife, which Joan died 2 day of November A.D. 1492, which Robert caused this chapel to be made A ... and the same Robert died". 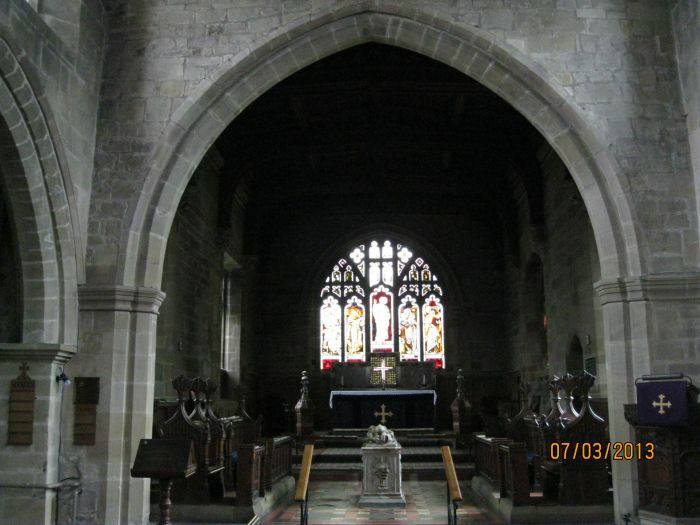 All Saints Church, Youlgreave, Derbyshire: Looking into the Gothic chancel, of which nothing remains of the original Norman structure including the chancel arch. The chancel walls are a mixture of 14th, 15th and 19th century building work. 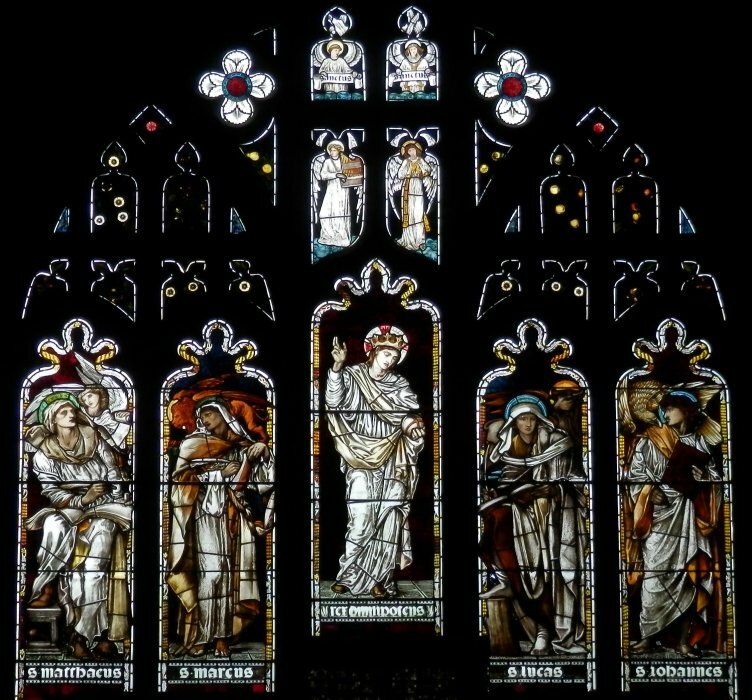 All Saints Church, Youlgreave, Derbyshire: The later Victorian insertion of the five light east window beyond the altar in the chancel. 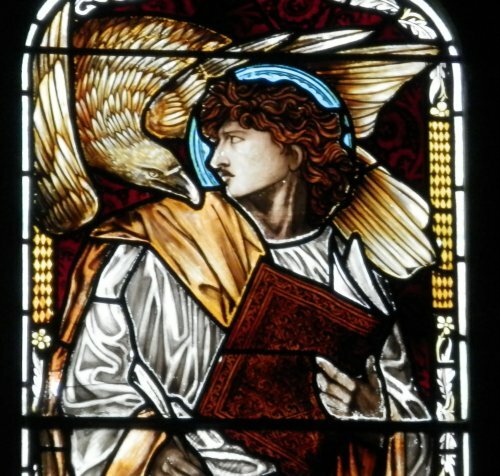 This painted glass window of 1876 was designed by the Pre-Raphaelite painter Edward Burne-Jones and made in the workshops of William Morris. 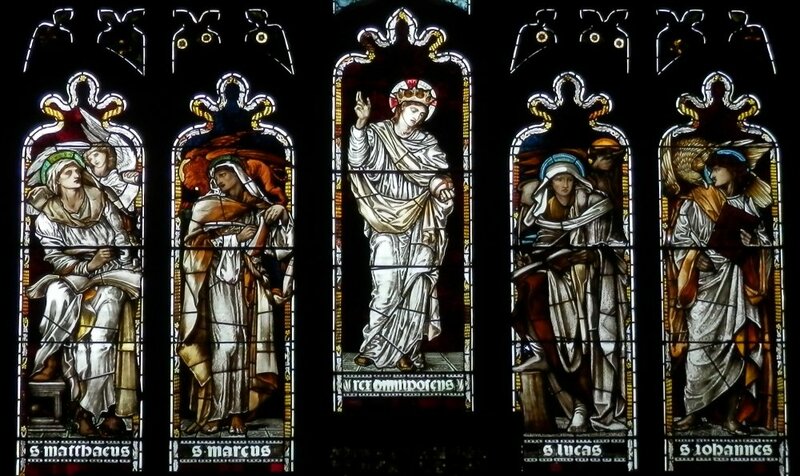 The five lights contain the figures of the four evangelists flanking the figure of Christ, Salvator Mundi. 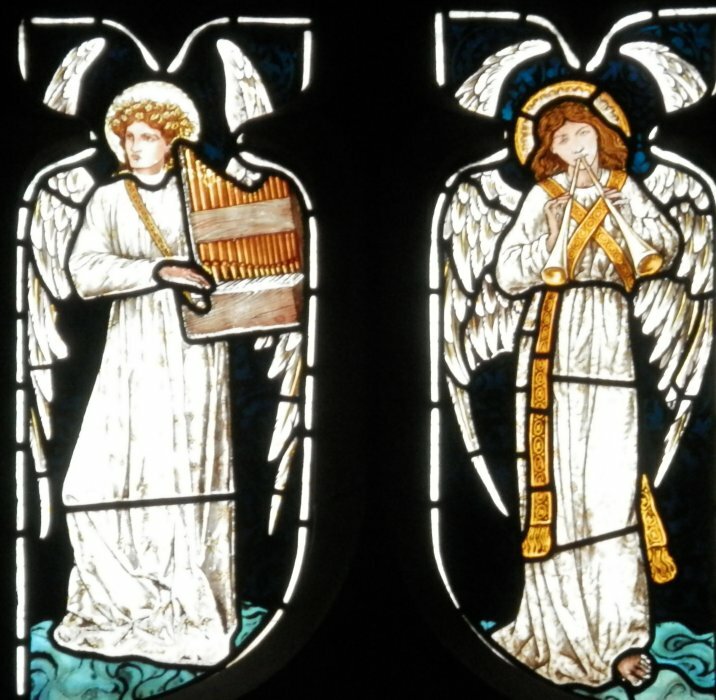 In the tracery above are four figures of angels designed by William Morris. 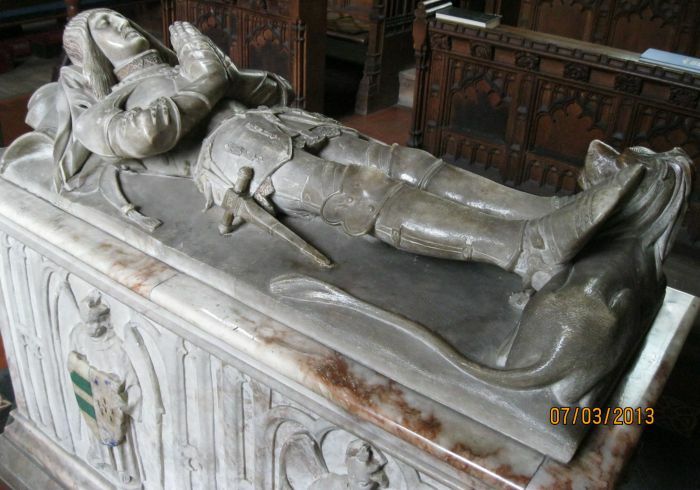 All Saints Church, Youlgreave, Derbyshire: The finely carved alabaster tomb of exceptional quality in the centre of the chancel is that of Thomas Cokayne, a member of an important local family. 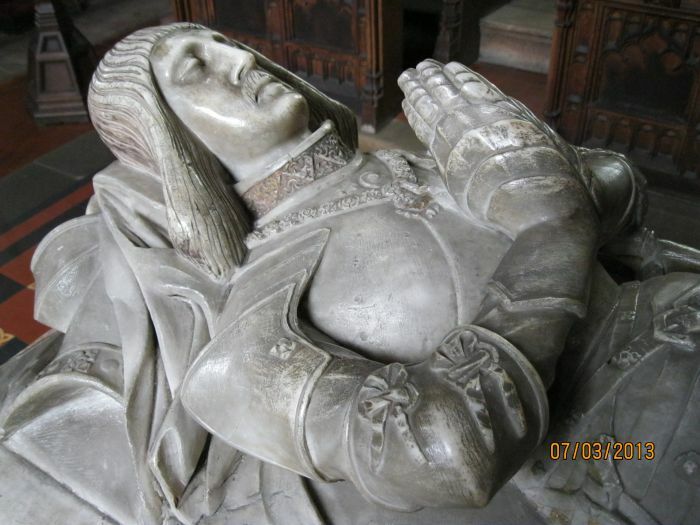 Quarrelling over a family marriage settlement, he died in 1488 in a fight with Thomas Burdett at Pooley Park in Warwickshire, while they were both on their way to Pooley Church (more details below). 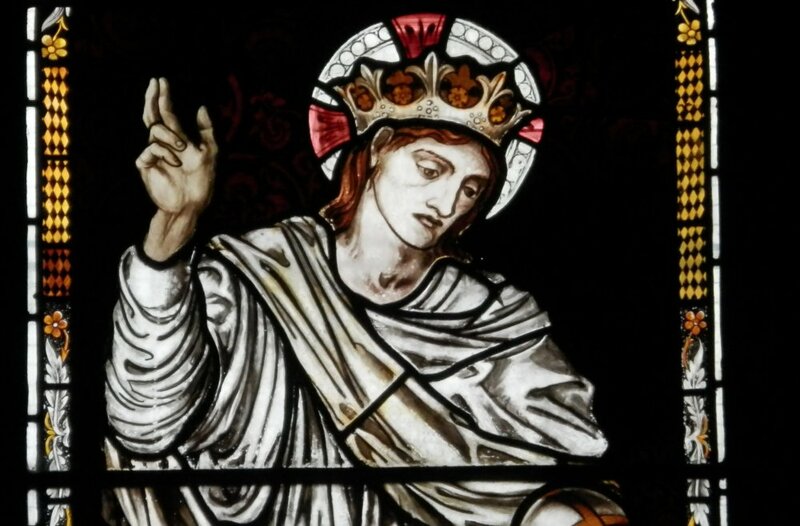 All Saints Church, Youlgreave, Derbyshire: Thomas Cokayne lies on his tomb in plate armour of the period, with gorget and a skirt of chain mail armour, a Yorkist collar of suns and roses hangs around his neck, his feet on the back of a lion and his head on the family's punning crest of a cockerel. 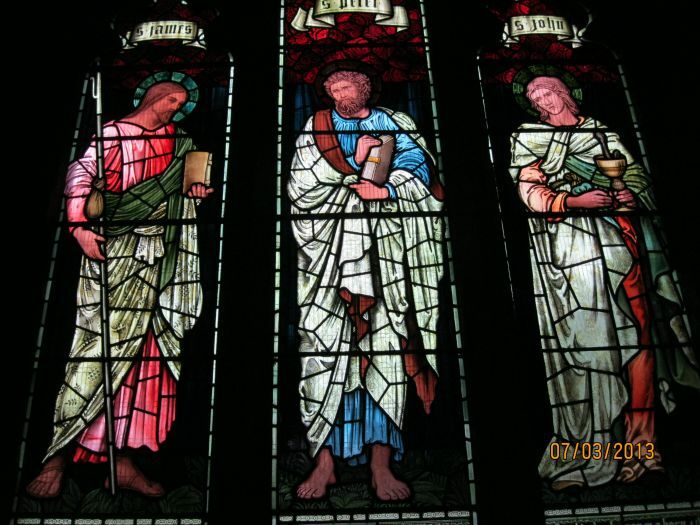 All Saints Church, Youlgreave, Derbyshire: The three light window in the south wall of the chancel dates from 1897 and dedicated to the memory of Vicar Richard Clarke Roy, also from the workshops of William Morris. 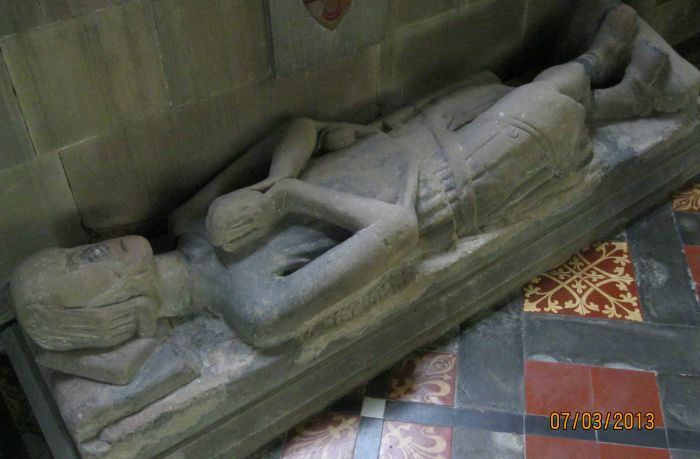 All Saints Church, Youlgreave, Derbyshire: The tomb in the north side of the sanctuary is an early 13th century carved effigy of a knight (probably Sir John Rossington, maybe dated ~1325?) with crossed legs, dressed in a quilted gambason, his head on a pillow, his feet lying on the back of a dog and holding a heart in his hands in a praying stance. 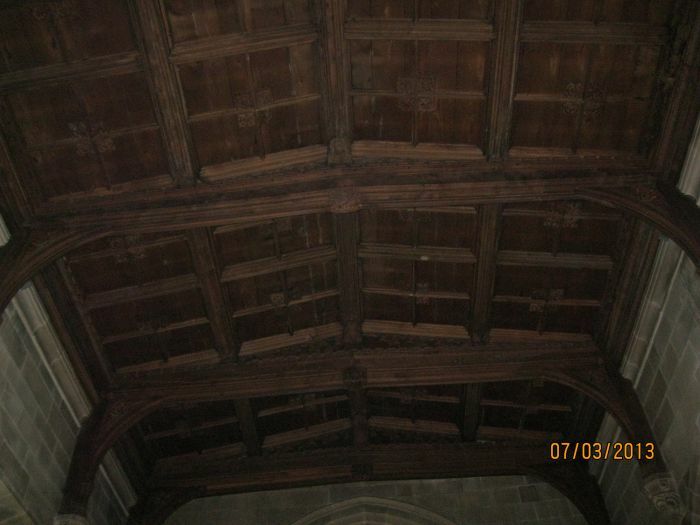 All Saints Church, Youlgreave, Derbyshire: The 15th century Tudor roof of the chancel and its carved bosses (I'm afraid can't be make them out in this photograph). Many of the fine oak timbers date from the 16th century. 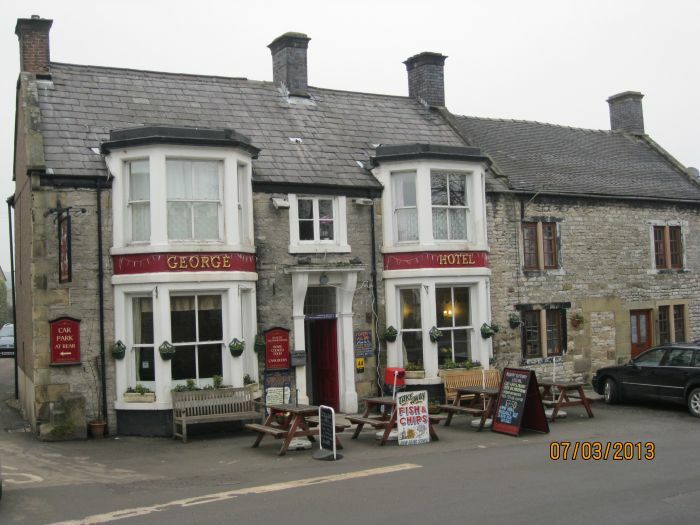 The Village of Youlgreave, Derbyshire: The George Hotel for refreshment after visiting the church.